Thank you to The Home Depot for sponsoring today's post and giveaway! Merry Thanksgiving Eve! That's a thing, right? To celebrate I thought I'd share my holiday marquee that I built for the Do-It-Herself Workshop at The Home Depot. There's also a $500 giveaway. But I'm sure you're just here for my wit and DIY skills, right? I'm crazy excited about how this thing turned out. And I seriously did most of it myself. Which is weird. And liberating. And scary. Probably dangerous too. Honestly, co-hosting this workshop was the final push I needed to take some of these woodworking projects into my own hands. The Do-It-Herself workshop was last Thursday. I co-hosted the event at the Urbandale, Iowa location. The staff at the store was amazing. They were organized, supportive and super friendly. Look at this apron they made for me. Seriously adorable. The Home Depot staff went through the basics for building the holiday marquee. My job was to share tips and tricks along the way. And post Instagram photos. The blogger "job" is a hard one. I want to thank everyone that attended! We had a packed room. I do wish there was more mingling time. The project demonstration was fairly time consuming which didn't leave much time for me to be socially awkward. But seriously, thank you to everyone that attended! They did allow me to touch power tools. This Ryobi beast should be added to my Christmas list. After the demonstration we handed out tools and gift cards! It's like the holidays came early! One lucky attendee even won the display sign. I won the skills to build my festive sign! I look forward to attending Do-It-Herself workshops in the future. I'll be sharing my tutorial for this project next week! Now it's your turn for a chance to win. The Home Depot is offering a $500 gift card to one lucky reader! Yeah, you read that right. $500! Ike wishes you good luck! 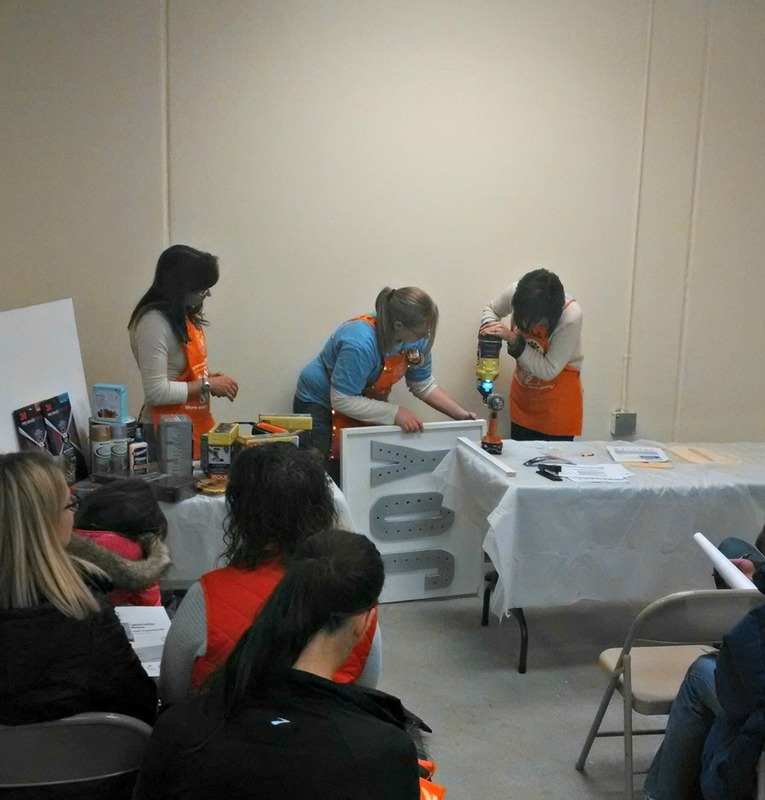 The Home Depot partnered with bloggers such as me for their DIH Workshop program. As part of this program, I received compensation for my time. They did not tell me what to purchase or what to say about any product mentioned in these posts. The Home Depot believes that consumers and bloggers are free to form their own opinions and share them in their own words. The Home Depot’s policies align with WOMMA Ethics Code, FTC guidelines and social media engagement recommendations.